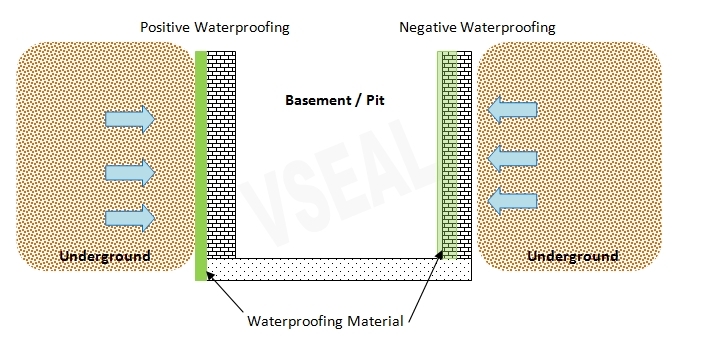 Introduction:What is negative side waterproofing? The common issues of the water leakage at the basement / lift pit / machinery pit is the water leak through the wall from the external side into the internal area. In the normal standard of waterproofing treatment, the waterproofing material is should always apply at the surface where it has the direct contact to the water. Whereas, for negative side waterproofing, the waterproofing material is applied at the internal side of the wall to prevent the water leak thru it. Negative waterproofing is useful especially the external side of the wall cannot be reached. KÖSTER NB 1 Grey is a mineral coating comprises of crystallizing and capillary-plugging agents. It is suitable used for waterproofing against ground moisture and for pressurized and non-pressurized water. It can withstand of >130m water head water pressure and suitable for positive and negative side of waterproofing. KÖSTER NB 1 Grey has great pressure and abrasion resistance. It is approved by the Germany building authorities and tested in accordance with the potable water guidelines. KÖSTER NB 1 Grey is suitable for new construction waterproofing as well as restoration for waterproofing at basement , tanks and pits. KÖSTER NB 1 is tested to resist a water pressur of 13 bar (130 meters water head) on the negative side. KÖSTER NB 1 does not contain corrosion promoting ingredients. KÖSTER NB 1 does not require moisture curing. KÖSTER NB 1 is tested also on porous substrate. KÖSTER NB 1 creates a visible and measurable waterproofing layer. KÖSTER NB 1 is also certified for drinking water purpose. Basement often cannot be access from the external . Hence, negative waterproofing is one of the least solution available. Very Often the filled water tanks cannot be entered to repair the water leakage, however, KÖSTER NB 1 allows to repair the leakage from the outside (negative side) which will not cause interruptions of water usage.